An unprecedented flood has taken over the entire Ahmadu Bello way in Victoria Island, Lagos on Saturday, forcing some residents and commercial offices to unceremoniously vacate their premises. The Lagos State Police Command has temporarily closed the road for human and vehicular movements due to the threat of heavy flood.The News Agency of Nigeria reports that Ahmadu Bello Way in Victoria Island, Lagos has been flooded due to continuous downpour experienced in the state since three days ago. The command’s spokesman, ASP Olarinde Famous-Cole, told NAN that the second link road to the Island coming from Lagos mainland was unsafe for motorists. Famous-Cole said that the downpour in the state has caused flood making other roads on the Island unsafe. 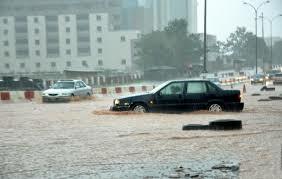 He said that the flood has caused traffic gridlock in parts of Victoria Island and its environs and advised motorist plying Ahmadu Bello Way and other areas prone to flood to take alternative routes approved by traffic officials. “The flood in the area has caused us to temporarily block Ahmadu Bello Way for the safety of motorists. “We want the public to know that the relevant traffic and security agencies are on the ground to flush out the drains and secure road users in the state,’’ Famous-Cole said. Mr Mahmud Hassan, the Public Affairs Officer, Lagos State Transport Management Authority (LASTMA), told NAN that their men have been on the ground since morning ensuring that road users use alternative routes provided. He said that the flood has caused hardship to road users and people living in the area. Mr Tosin Olalere, who resides at Abraham Adesanya Estate near Victoria Island, told NAN that he has been in his house since Wednesday due to the continuous rain. “There has been no vehicular movements since Wednesday, July 5, till now. “People in my community have resulted to trekking or using the canoe to move about. “Some people have even started moving out of the community because of the flood which destroyed their properties,’’ Olalere said. Similarly, some soldiers, who are residing in the Bonny Cantonment, told NAN that a significant number of residents have been forced to vacate their homes. Some passengers in a commercial bus from Mainland to Island in Lagos also complained of the outrageous amount they paid to get to Victoria Island due to the flood on Ahmadu Bello Way. A student, who declined to give her name, said she spent over four hours in traffic from Oshodi to Ajah because of the flood. She said she and other passengers paid N1000 from Oshodi to Ajah instead of the N400 being paid on a regular day. “People were even rushing to board the bus despite the crazy increase in the fare,’’ she said. Another passenger who simply gave her name as Obianuju, said she tried to avoid paying N1000 to Ajah from Oshodi, however, boarded a bus to Obalende for N250 from Oshodi only to find out that the fare from Obalende to Ajah had also skyrocketed.